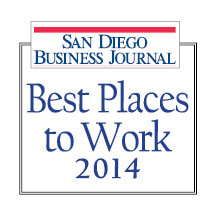 TakeLessons was recently named as one of the Best Places to Work in San Diego. This 8th annual program was created by the San Diego Business Journal and Best Companies Group, and sponsored by Moss Adams LLP, Kaiser Permanente, United Concordia, Active Network, and Paradise Point. This survey and awards program was designed to identify, recognize, and honor the best employers in San Diego, benefiting the state's economy, workforce, and businesses. The list is made up of 100 companies split into four categories: 33 small-sized companies (15-49 US employees), 33 medium-sized companies (50-249 US employees), 14 large-sized companied (250-1,999 US employees), and 20 mega-sized companies (2,000 or more US employees). TakeLessons has been named one of this year’s Best Places to Work in San Diego in the medium category. Companies from across the county entered the two-part survey process to determine the Best Places to Work in San Diego. The first part consisted of evaluating each nominated company's workplace policies, practices, philosophy, systems, and demographics. The second part consisted of an employee survey to measure the employee experience. The combined scores determined the top companies and the final ranking. Best Companies Group managed the overall registration and survey process in San Diego, analyzed the data, and determined the final rankings. The actual rankings will be published in the August 18th issue of the San Diego Business Journal, and the ranked companies were recognized at a special awards ceremony on August 7, 2014.